Alternative Text For Images. What is it though? Alternative text is text associated with an image that serves the same purpose and conveys the same essential information as the image. In situations where the image is not available to the reader, perhaps because they have turned off images in their web browser or are using a screen reader due to a visual impairment, the alternative text ensures that no information or functionality is lost. Absent or unhelpful alternative text can be a source of frustration for visually impaired users of the Web. 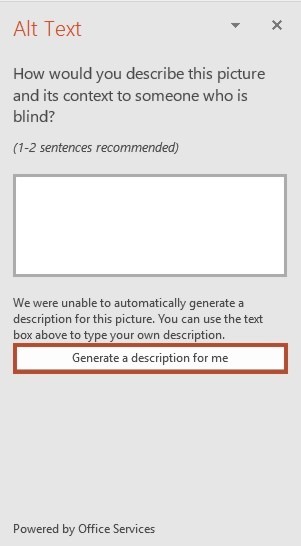 Thankfully in PowerPoint 365, it automatically generates Alt Text for photographs by using intelligent services in the cloud. PowerPoint 365 doesn’t generate Alt Text for Drawn Images, such as Clip Art, Diagrams or Icons. 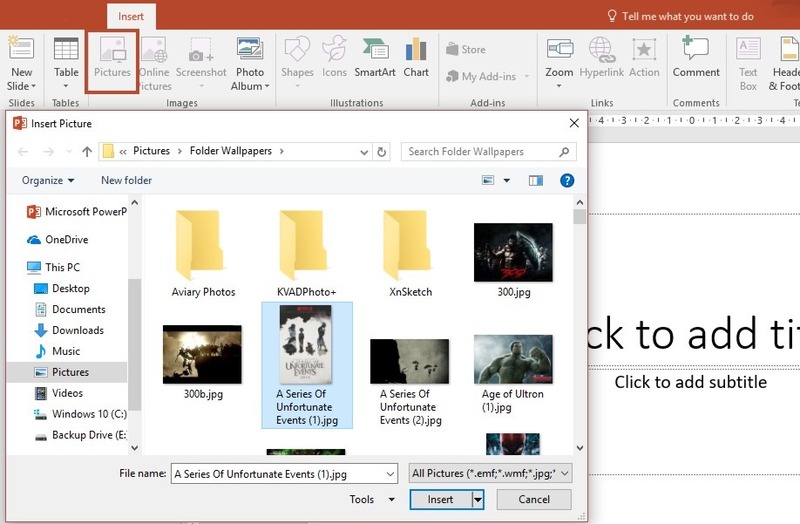 In this post, I will describe the Alternative Text Feature for Pictures in PowerPoint 365. All you have to do is to continue reading. In order to Add Alt Text on an Image, first we must have an image inserted in our Presentation. Then wee must select the Insert tab and from the area of the ribbon named Images, we select the command Pictures as shown below. Once the Pictures command is selected, the Insert Picture dialog box appears where we must navigate and select the Picture that we want and then press the Insert button in order for the Picture to be inserted in our Presentation. 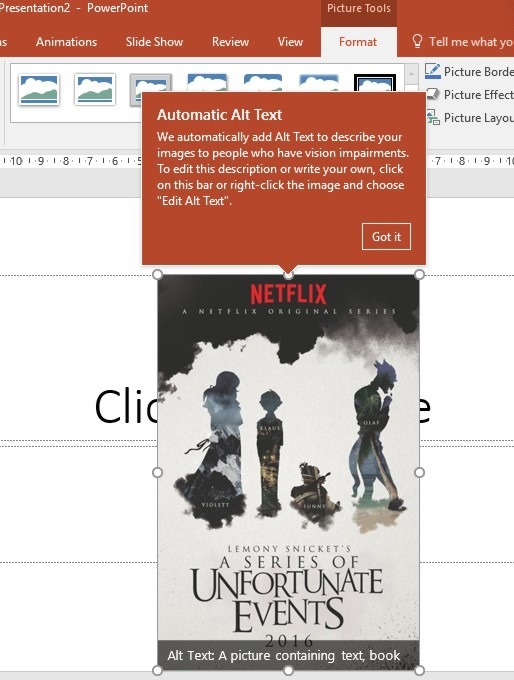 At the bottom of the Picture, we can see the Alt Text that already exists and which is the following for this case: A Picture Containing Text, Book. 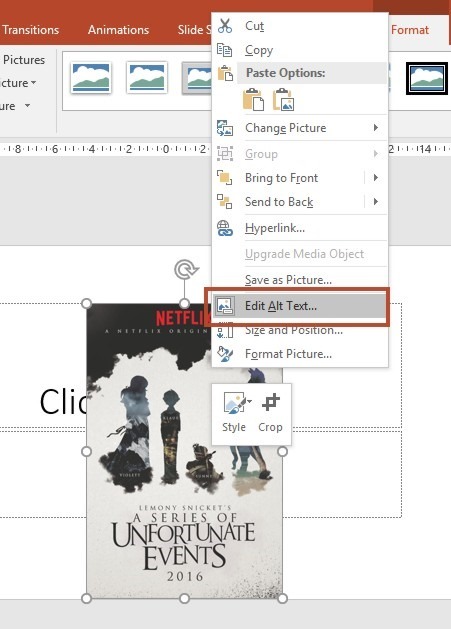 If we want to edit or change the Alt Text for the image, we must do a right-click on it with our mouse. Once done, the shortcut menu appears where we must select the command Edit Alt Text as shown below. In the text box below the notification area we can delete, edit and write our own Alt Text for the image. All we have to do is to insert our cursor in the text box and start typing our own Alt Text. Straight away the Alt Text will be created for the Image. 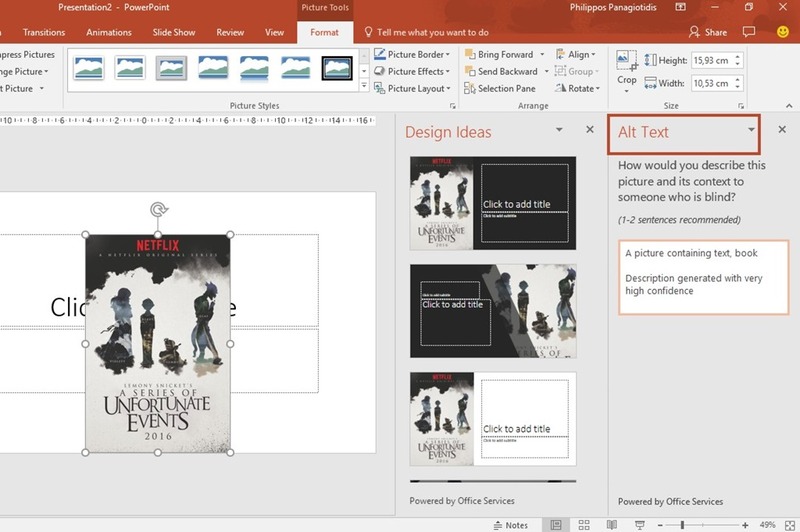 Below you can check out the video describing How To Add – Edit Alt Text on Images in PowerPoint. Posted on April 26, 2017, in Microsoft Office 365 ProPlus English, PowerPoint 365 English and tagged A Picture Containing Text, Add Alt Text in PowerPoint, Alternative Text For Images, Book, Edit Alt Text, How To Add Alt Text on Images in PowerPoint, Images, Insert Picture, Microsoft Office, Microsoft PowerPoint, Office Smart, Office System, PowerPoint 365, Smart Office, Task Pane, We Automatically Add Alt Text To Describe Your Images To People Who Have Vision Impairments. Bookmark the permalink. Comments Off on Add Alt Text in PowerPoint 365.